Cold pressed fresh juices which are drunk immediately contain all the necessary vitamins and minerals that the body needs which are absorbed more easily than supplements. The vitamins in fresh juice help regulate our metabolism and assist in the conversion of fats and carbohydrates into energy. Fresh juice also contains minerals that are necessary for nerve and muscle function, as well as being important for building body tissues. Fresh juices are high in antioxidants which help to defend us against heart disease and certain cancers as well as having many medicinal effects. For example, blueberries are effective against diarrhoea; ginger alleviates motion sickness and nausea; and pineapple can soothe sore throats. Freshly squeezed or cold pressed juices are the best juices of all. Fruit and vegetable juices that are made then drunk immediately are by far the most superior as oxidation does not destroy the nutritional value of the juice. 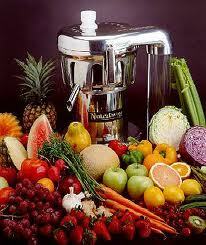 Heat reduces the amount of vitamins, minerals, enzymes and proteins in juices so using a cold press juicer is best. Avoid juice drinks that are normally found in the soft drinks section of the supermarket which are not 100 percent juice. Sometimes they are only 5 percent actual juice! These drinks contain mostly water, as well as a lot of sugar, additives and flavourings, and have few nutritional benefits. The length of time that you can store juice depends on the type of juicer you use, what you are juicing, and how you are storing the juice but generally with a good quality cold press juicer your juice will stay fresh and ‘vital’ for up to 48 hours. Always store fresh juices in a glass, air-tight jar or bottle in the fridge. Both long life and short life juices have been pasteurised, with the long life juices being more heavily pasteurised so that they can last for up to 9 months without refrigeration. Short life juices are able to be kept for 2 to 6 weeks in the fridge. Neither of these types of juices are freshly squeezed, they are made from concentrate, or the juice has been extracted in the country of origin before being pasteurised and shipped. The pasteurisation and packaging process means that a lot of the valuable nutrients have been lost. Strong tasting vegetable juices such as beet and spinach are high in compounds that should be consumed in small quantities. It is a good idea to dilute these with milder juices such as carrot or celery. Fibre is extremely important to the body to move waste through the colon and fresh juices can help to supplement the amount that you get. However, you should remember that juices are not intended to be the main source of fibre in your diet. You can also stir in a tablespoon of psyllium husks or chia seeds into your juice to increase your fibre intake.